ANTIQUE IFUGAO BULUL STATUE PAIR CIRCA EARLY 1900'S. 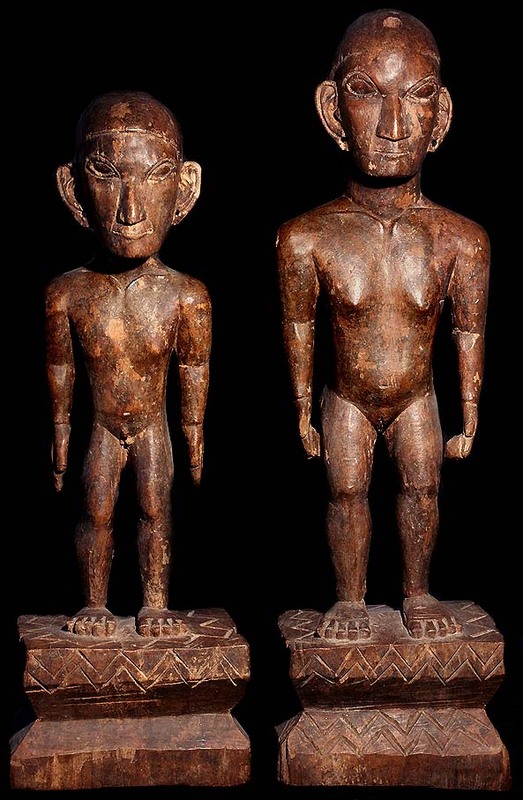 THIS REMARKABLE PAIR COMES FROM THE HAND OF "TAGUILING" THE ONLY KNOW TO HISTORY IFUGAO "BULUL" STATUE CARVER AN "IFUGAO TRIBESMAN" FROM THE CORDILLERA MOUNTAINS ON THE ISLAND "LUZON" IN THE PHILIPPINES! THESE RARE AND UNUSUAL PIECES HAS A FINE, RICH, DARK, BROWN PATINA. THIS UNUSUAL BULUL PAIR MEASURE APPROXIMATELY 19 INCHES TALL, BY 6 INCHES WIDE, BY 4 INCHES DEEP. THESE ARE EXTRAORDINARY PIECES OF OLD TRIBAL ART! AND EXHIBIT WEAR AND SIGNS OF TRIBAL USE. are handed down to the first child of a family. holes made by insects in the granary. Ifugao culture revolves around rice, which is considered a prestige crop. There is an elaborate and complex array of rice culture feasts inextricably linked with taboos and intricate agricultural rites, from rice cultivation to rice consumption. Harvest season calls for grandiose thanksgiving feasts, while the concluding harvest rites "tungo" or "tungul" (the day of rest) entail a strict taboo of any agricultural work. Partaking of the rice wine (bayah), rice cakes, and 'moma' (mixture of several herbs, powdered snail shell and betel nut/ arecoline: and acts as a chewing gum to the Ifugaos) is an indelible practice during the festivities and ritual activitiess. their retual and Agricultural terracing is their principal means of livelihood along with farming. Their social status is measured by the number of rice field granaries, family heirlooms, gold earrings, carabaos (water buffaloes), as well as, prestige conferred through time and tradition. The more affluent, known as kadangyan were usually generous by nature, giving rice to poor neighbors in time of food shortage(s) and/or hardship(s). Furthermore, their culture was known for their legal system, using one of the world's most extensive oral legal traditions specifying the offense depending on the use of custom law; trial by elders (influenced in part by public opinion); or trial by ordeal. The wealthy were subjected to greater fines than the poor. and or status of the woman. KANKANAY, IBALOI AND GADDANG AS A SINGLE TRIBE! CULTURAL DIFFERENCES AND BELIEF SYSTEMS!